Healthy hair is composed of 95% protein, 3% moisture and trace elements, and 2% natural lipids. Chemicals, chlorinated and salt water, UV exposure, flat ironing, and blow-drying all can strip hair’s natural lipids, leaving hair brittle, weak and unmanageable. 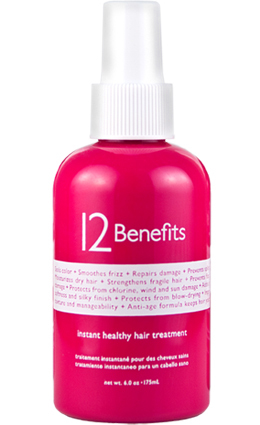 12 Benefits™ Instant Healthy Hair Treatment is multi-functional and prevents and repairs hair damage with only 6 concentrated ingredients. 12 Benefits™ precise composition of natural hair lipids and UV absorbers in ultra pure steam-distilled water, reverses stress associated with chemicals, thermal styling and environmental exposure. Following haircolor applications, 12 Benefits™ seals and protects for longer lasting and illuminating color results. In fact, our cutting edge anti-aging technology from Japan is proven to retain hair color 40% longer after 5 wash-outs. Misting 2–3 times daily mid-shaft to ends (where natural hair lipids are shampooed away before these essential hair moisturizers typically extend) will dramatically reverse the aged and damaged look and feel of hair. Important ingredients: Purified steam-distilled water, Natural lipids, UV absorbers, Sunscreen. Salon clients will notice that their color will hold truer longer and highlights will be less fragile with each use. 12 Benefits™ Instant Healthy Hair Treatment should be recommended to all clients with hair color or clients regularly stressing their hair with daily blow-drying and flat ironing.